Random conversations about this and that. I’ve always been interested in grids and patterns. I often stare at the night sky looking for consistent configurations between groups of stars. I look for textural regularities on the surface of the ocean or in desert sand. Random street noises fascinate me and I tend to organize them in my imagination as sounds that relate to one another in some cohesive form. Jackson Pollock’s random motion patterns mesmerize me as much as Piet Mondrian’s strict vertical-horizontal scapes. Not surprisingly, I’ve always been interested in music that is highly repetitive. The first vinyl I ever owned was J.S. Bach’s Fuge in G Minor, BWV 578, also known as the “Little Fuge”. I would follow the sound pattern as it kept repeating itself at different pitches, as it were a mantra or a never-ending echo. I could follow the notes by projecting imaginary dots and lines in space and watch them interlace to create an exquisite geometric pattern. It amazed me to see how independent sounds could produce such a harmonious result. By age 17, I had amassed a reasonably large collection of what I refer to as “grid music”, in particular polyphony of the Middle Ages, where melodic voices, or instruments, create a similar hypnotizing pattern effect. Of course, I also loved rock, folk and pop music, but I always had a special regard for my Early Music collection that included dozens of extraordinary recordings by the Harmonia Mundi label. 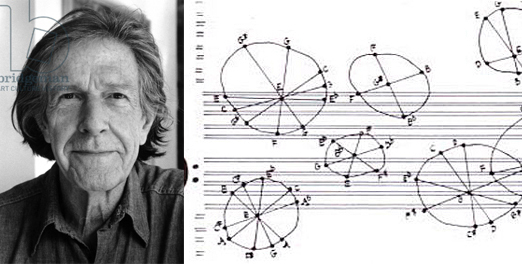 During my college years I became interested in John Cage’s approach to composing. His experimental process inspired me to look at music in new ways, leading me to discover music made by Robert Moog on voltage-controlled analogue synthesizers, as well as works with analogue and electronic synthesizers by artists like Steve Reich, Terry Riley, Brian Eno, Hans Joachim Roedelius and, my favorite in the genre, Klaus Schulze, a German music composer who I consider among the most important pioneers of electronic music. I first became aware of Schulze in 1975 at a California College of Arts party in Oakland, CA. One of his first albums, Timewind, was playing in the background acting as unifying musical texture to the loud noise and random conversations going on in the room – hard to tell where the music ended and the noise began. Curious, I asked for headphones to appreciate in more detail the complex, multi-layered rhythmical patterns of the music. I had never listened to anything like it. Klaus Schulze was born in Germany in 1947. With over 60 albums released in five decades, he remains among the most prolific electronic music artist today. In his early years, Schulze had brief collaborations with bands like Tangerine Dream and Ash Ra Temple. In 1972 he released his first album Irrilicht, a rather unconventional experiment played with a conventional electric organ backed by a recording of a classical music composition played backward, beyond recognition, then mixed on tape into a three movement symphony. While Irrilicht was recorded without a synthesizer, the album is regarded as a milestone in ambient electronic music. Among many extraordinary recordings that followed, three stand out among the finest synthesizer music albums ever produced; Timewind (1975), Mirage (1977) and X (1978), this last one I regard as Schulze’s greatest masterpiece. X is a biographical musical album celebrating a selective group of intellectuals that influenced Schulze: Friedrich Nietzsche, George Trakl, Frank Herbert, Friedemann Bach, Ludwig von Bayern and Henrich von Kleist. These recordings mix classical string orchestra instruments looped on tape, percussion music, and lush synthesizer sounds that result in a highly elaborate instrumental composition of grand proportion. While X may have been more influenced by Schulze’s interest in Richard Wagner, his early focus on sequencing and sound patterning shine through and give structure to the emotional dissonant sounds present throughout the composition. For those of us who enjoy deconstructing music into basic sound patterns and grids, Mirage is a most listen. Here Schulze creates a multi-layered rhythmical framework where each sound moves in parallel, oscillating, other sounds collide with each other to form an ever-growing crescendo of notes traveling in space. This is sequencer music at its best. Klaus Schulze, like most experimental artists, resists any association with a particular music category. His influence runs deep in ambient music, trance, techno and new age, including many current styles like rave, electro house and downtempo. 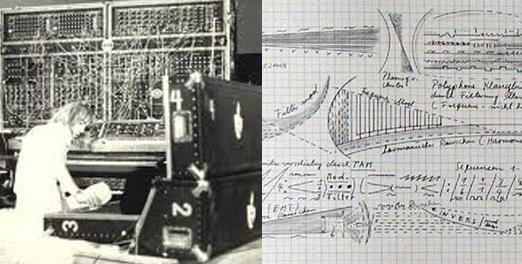 Unlike many of his contemporaries, Schulze did not stay in the Oort Cloud of electronic music. With an indomitable experimental spirit he has continued to take creative risks and explore new ways of channeling his music to different audiences, such as The Dark Side of the Moog, a collaboration with Pete Namlook and Bill Laswell performing a variety of Pink Floyd covers, as well as his recent collaboration with singer Lisa Gerrard (Dead Can Dance). Electronic music today has become mainstream and is intrinsic in many music categories, from film scores and Musak, to edgy contemporary artists like Mousehead and Radiohead among hundreds. But nothing is more satisfying than listening to the original pure compositions of experimental music pioneers who struggle with the unknown and take extraordinary artistic risks. Perhaps not always producing agreeable work, but always pushing the boundaries of convention. The exceptional music produced by artists like Bach, Reich, Cage and Schulze that I’ve followed since my early years remains current in my music preferences and continues to grace my imagination with magnificent patterns of sound in space. This entry was posted in Art and tagged Bach, Electronic Music, Grid, John Cage, Klaus Schulze on February 24, 2013 by agusgarza.